Houston isn't slowing down... it's reaching for the sky with high-rise condos and apartment buildings going up all around town. The current building boom rivals that of the 80's as modern towers with amazing amenities keep getting announced, each seemingly trying to outdo the previous one. Rooftop pool that hangs over the side of the building? Check. Bar carts and bartenders that come to your condo and mix up an after dinner drink? No problem. Houston has always been a world class city, and the high-rise living options are reflecting that more than ever. 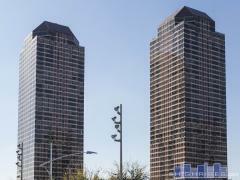 Below are all the mid to high-rise condos currently available for sale in Houston. You can also search by building and see what's available in real time in our Houston high-rise building database.